UH West Oʻahu University Band performing at the fall 2015 commencement ceremony. Join the University of Hawaiʻi – West Oʻahu University Band, sing with the University Chorus, and play and sing mele Hawaiʻi (Hawaiian music) with the Hawaiian Ensemble at UH West Oʻahu this fall. Instruction begins Aug. 24 and will take place in the Pearl City High School band room on Wednesday evenings from 6:30 – 8:30 p.m. High school students interested in joining the UH West O‘ahu band should speak with their college counselor about applying for the Running Start or Early Admission program. All interested participants should contact Pearl City High School Director of Bands Chadwick Kamei at ckamei@hawaii.edu to schedule an audition. For all other questions, contact UH West Oʻahu Assistant Professor of Music, Dr. Jon Magnussen at jonmagnu@hawaii.edu. 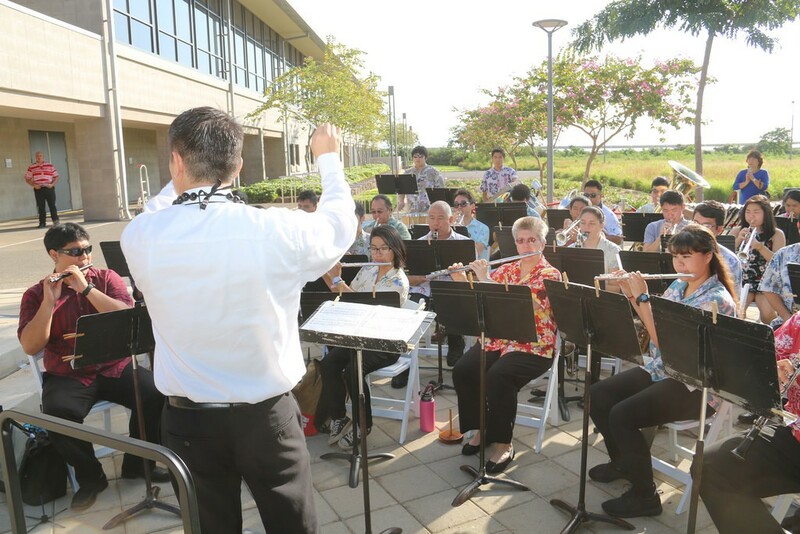 View a video performance of the UH West Oʻahu band rehearsing for the UH West O‘ahu Winter Concert in fall 2015. University Chorus students performing a lunch time concert at the UH West Oʻahu Campus Center. The UH West Oʻahu University Chorus (MUS 114), under the direction of Karol Nowicki, also welcomes new members for its fall 2016 season. Rehearsals begin on Aug. 23 with classes on Tuesdays and Thursdays from 11 a.m. – 12:20 p.m. at UH West Oʻahu. 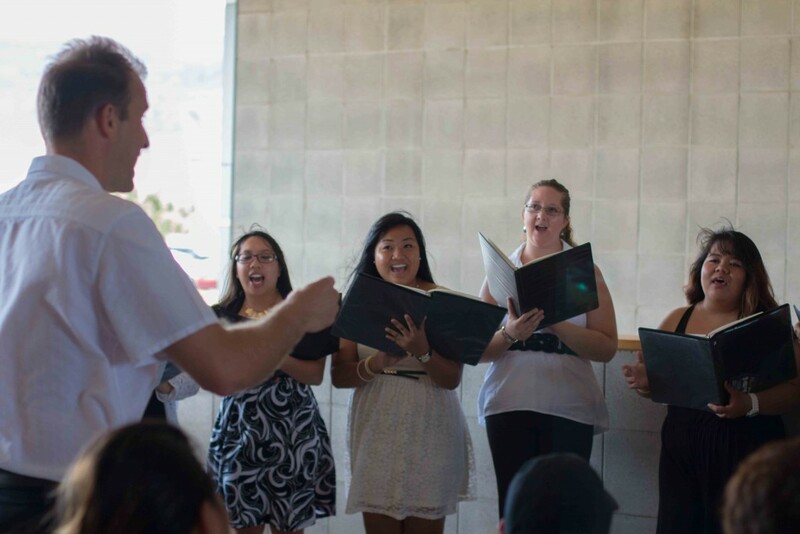 The University Chorus welcomes community musicians in addition to UH West Oʻahu students, faculty and staff. Members will spend the term singing choral literature from the Renaissance to the present, improving vocal technique, musicianship, and listening and ensemble skills. The ability to read music is not required. A highlight of the fall semester is the holiday concert, an end-of-semester collaboration with the University Band and Hawaiian Ensemble. For more information, contact Choral Director, Karol Nowicki at karoln@hawaii.edu or UHWO Assistant Professor of Music, Dr. Jon Magnussen at jonmagnu@hawaii.edu. View a video performance of the UH West Oʻahu University Chorus performing in the 2016 E Himeni Kākou with the mass collegiate choir. Hawaiian Ensemble students perform in front of the UHWO Campus Center. Now in its fourth year, UHWO Hawaiian Ensemble (MUS 211/MUS 311) is open to all students who can sing or play an instrument. Directed by kumu Kamuela Kimokeo, students work in small groups on Tuesday and Thursdays from 12:30-1:50 p.m. to create arrangements in the nahenahe (sweet, gentle) style and practice group performances, honing their kani ka pila (style of Hawaiian music playing in an impromptu group jam session) skills as collaborative musicians. A highlight of the semester is the PIKO Project-sponsored Hoʻokani Kulanui sessions with local Hawaiian music artists and kumu Kimokeo. 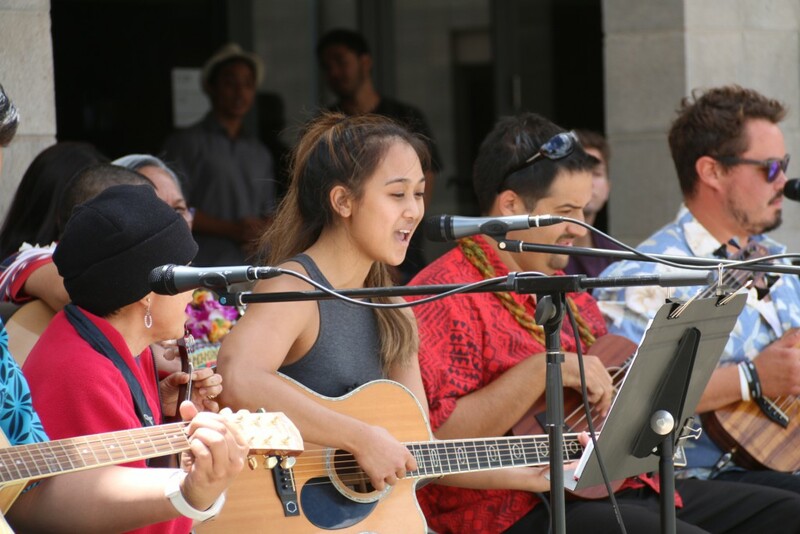 Community members are invited to join the students on the third Thursday afternoons of September, October and November, as they learn mele (Hawaiian songs) from the artists in a friendly talk-story format. Past artists have included Palani Vaughan, Raiatea Helm, Kawika Kahiapo, Jerry Santos and others. 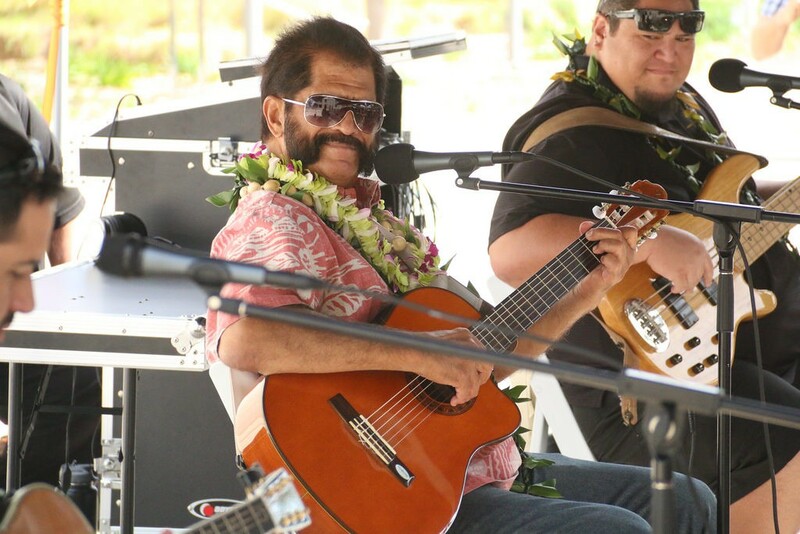 Nā Hokū Hanohano Award Winner and Hawaiian Music Hall of Famer Palani Vaughan performing at Hoʻokani Kulanui on Feb. 18. To apply to UH West Oʻahu, visit http://www.uhwo.hawaii.edu/admissions, call (808) 689-2900 or email uhwo.admissions@hawaii.edu. Tagged band, Chad Kamei, Chadwick Kamei, chorus, Hawaiian Ensemble, Hoʻokani Kulanui, Hookani Kulanui, Jon Magnussen, Karol Nowicki, music, Palani Vaughan, PIKO Project, Raiatea Helm, UH West Oahu band, University Chorus. Bookmark the permalink.